Ah, "Die Hard". There's so much to this re-release and this movie. I'll start with the movie. 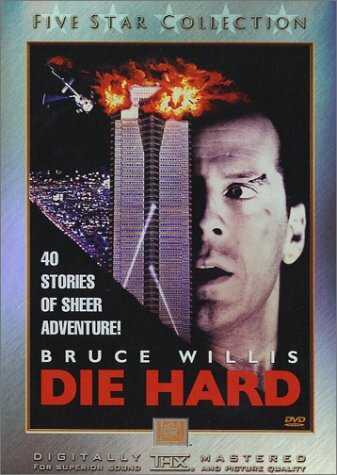 One of 1988's biggest hits success stories at the box office and critics, "Die Hard" started a nice franchise for Fox. While it doesn't sound strange Bruce Willis is known as an action star (in my opinion, I think he's an incredible actor who's not just action. He has a wide range of talents with interesting choices but that's another story), some people laughed at the thought of it when this movie came out. The only major role Bruce Willis had before "Die Hard" was in "Blind Date" and he was still going strong on the fabulous 1980s series "Moonlighting". Still, Willis blew everyone away with his power packed performance as John McClane, and from there he rose to super stardom. "Die Hard" is not your usual thriller that's mindless or happens to have a stupid plot tied with mindless action scenes. While it does feature some great stunts and great action sequences, I think it's one of the best action movies I have ever seen. The story isn't as far fetched as it may present itself, and has some great dialogue, a well rounded story, developed characters and memorable lines all laced with some fun humor that always brings a smile to my face. "Die Hard" is a movie that appeals to so many and works for many. It's a very satisfying movie. "Die Hard" follows Bruce Willis as John McClane, a New York City police officer who travels to Los Angeles to spend time with his wife, who he's seperated from, Holly (Bonnie Bedelia). His wife got a great job for Nakatomi, a large corporation, and John goes to a Christmas party at their skyscraper plaza to meet up with her. However, the party isn't all fun and games... terrorists invade the building, close it down, lock the elevators and take hostages. The terrorists are led by Hans Gruber (a fantastic Alan Rickman) who demands a whole lot of money. Guess who's the one man who must stop them? I mentioned nearly all the elements that made "Die Hard" a success. Great story, great script, likeable characters that are developed, fantastic action and good thrills. But how does it all come together? Why, with director John McTiernan of course! McTiernan is no stranger to action thrillers (and after this movie he continued to do them) with "Predator" under his belt, and he works wonders with "Die Hard". The movie goes at a great pace and really builds things up nicely. There is a fantastic, even structure so you'll never get bored and the movie doesn't feel tacked or dragged on. The editing makes you see all the action and won't confuse you about the action that's going on. Some really great editing... it's no wonder why it got an Oscar® nomination. The acting here is also fantastic. Bruce Willis only begins to scratch the surface of what he is capable of. He's perfect and really fits the bill as McClane. Yes he's macho and has a gruff exterior within him, but there's conflict growing strongly within him about the stiuation and himself. Rickman as Gruber does one fine job and is also perfect for his role, he really gets into the core of the guy and is so fun to watch as the nasty terrorist. The rest of the supporting cast (especially Reginald VelJohnson) also do justice to their roles. "Die Hard" is a great action packed thrill ride. You can sit down and enjoy it. It's not a dumb, mindless thriller but rather a complex one complete with great stunts, great action, great direction, a great plot and great acting. Everything about this movie is great and works really well. If you love action films or a movie that brims with suspense as well as a good story, you owe it yourself to check out "Die Hard". When "Die Hard" was originally released, it was non-anamorphic and pretty lackluster. This THX-Certified transfer (the other one was too) is pretty good and this time around is anamorphic (aspect ratio 2.35:1). While it does improve and looks good, it's not perfect. Blemishes, dirty and grain appear here and there, and images at times look a bit soft and faded. I was expecting more sharpness to the image, but I did notice noise appeared pretty often. Black levels however are deep and solid, while detail is overall good. Some shimmering is present too. A little disappointing but all in all a great transfer. Fox has included an English Dolby Digital 5.1 in addition to the DTS 5.1. I really didn't notice muchy difference between the two except the DTS sounded much lower. I compared the two between key scenes and there's not much difference. I actually prefered the Dolby Digital a little more since it made more use and brought to life more of the background sounds. Surround use in the tracks are active, as they should be. This is an action movie. Gunplay, explosions and a lot of crashing... you name it. This movie, as you should know if you've seen it, has a lot that can be done with sound (which even got Oscar® nods in that department) due to the action. The thrilling score that keeps tension high sounds wonderful on the tracks and .1 LFE extension is nice. Sidewall imaging is pretty good. This track does an overall good job of making you feel like you're there experiencing what's going on. While I felt there could have been more zing to some key surrounds and some more creative mixing, what's here works rather well and people should be happy with these tracks. A French Dolby Surround is also included as well as English Closed Captions, English subtitles and Spanish subtitles. The box also lists a Dolby Surround track in English but is not on the disc, but can be found on the first DVD release. The audio is also THX certified. Woohoo! Another Fox Five Star Collection disc! While the original "Die Hard" DVD lacked in supplements, Fox has GREATLY made up for it with this incredible two disc set. The other "Die Hard" re-releases are simply special editions and also two-disc sets. You may wonder why, as there is a good reason. This one is the most packed. So let's start with disc one. We are treated to not one but two audio commentaries (for the theatrical version only). The first Audio Commentary features John McTiernan and Production Designer Jackson DeGovia. This track is clearly edited and a bit dry, but you do get very good information out of it from the two. They offer good and interesting production stories and offer praise for the cast and crew. It's amazing how they recall and talk about so many little details. They talk about ideas they had, how things were set up and the little things. They do have good memories of the film. This track isn't for everyone as some may find it a bit boring, but in the end it offers a lot of information on how things were achieved as well as other aspects of the production. The second Audio Commentary with Special Effects Supervisor Richard Edlund I found a lo more interesting. I believe Edlund got an Oscar® nod for this movie with the special effects, and he was a key force doing effects with the movie "Star Wars". Edlund is a bit more relaxed and jokey, but there are points he is really quiet. He offers some pretty insightful comments and really knows how audiences think and what they want to see. He offers his inspriations, praises the movie "Stuart Little" and makes some very interesting comparisons. People may also find this one boring, but I really liked it and he has a better attitude and is more interesting than DeGovia and McTiernan. The box says this commentary is screen-specific, but Edlund goes off on a tangent sometimes. Another commentary is included... this one in text form. The Subtitle Commentary by the Cast and Crew. This subtitle track features a variety of information that ranges from all sorts of things. There's quotes from the actors, the crew and interesting tidbits about the sets and other things. Unlike some other DVDs that incorporate this feature *COUGHBRINGITONCOUGH*, here you can easily turn it on and off with the subtitle key on your remote and they're not in annoying colored boxes or anything. There's also an Extended Branching Version of the movie. It's only a single scene that's extended and not even completed fully for that matter (I won't spoil the movie for others so I won't go into specifics about the scene), but this scene is also in the "Outtakes" portion of the second disc. Rounding out the first disc is a DVD-ROM Script To Scene Comparison. Most of the goodies are on the second disc. A lot of the stuff here is excellent and you'll probably enjoy what's given. From The Vault is the first section of the second disc and is divided into three sections. The first part, Outtakes is then divided into two scenes "The Vault" and "Turning Off The Power". The latter is the scene featured on the extended branching version while "The Vault" features bloopers and assorted deleted footage and two audio options: production and music or production only. Each are in anamorphic widescreen. The second section, The Newscasts has a variety of footage from the newscasts featured in the film. A lot of deleted stuff and alternative stuff is here, which is nice. Finally, Magazine Articles features two articles: one from American Cinematographer and the other from Cinefex. Each are the full text articles and you can blow up photographs and see video clips within them which is quite neat. Each are very nice reads. The Cutting Room Floor is probably my favorite section of the discs. If you're really into filmmaking (I for one am) then you're going to love this. The Scene Editing Workshop offers some background on editing and then you're choice to edit three scenes: "Hans and Takagi in the board room" (part 1 and part 2) and "McClane in the air duct". The last one only has three sections to complete the scene with three angles for each, while the first has eight sections and the second has ten sections with two-five angles for a scene (depends on the section). This is really nice and easy to use. While it has been featured on a few other DVDs, there's more to work with here and you can even compare your product to the final one in the film. Everything's in anamorphic widescreen though some of the stuff here is pretty rough. The Multi-Camera Shooting has a nice text intro and lets you watch three different scenes from different angles using the angle feature. It works rather well and is a cool feature to see (the scenes are anamorphic) though it can be rather short. Audio Mixing is another really cool feature with a good text intro. The "Track Evaluation" lets you preview the sounds and the "Mixing Suite" lets you mix them by volume. It's really well done and pretty fun. I really enjoyed Why Letterbox? it's a short little viewing piece that covers misinterperations of widescreen and the process of taking a widescreen image into full frame. Larry Yorr (SP?) who did the color correction for the fill to tape transfers and David Pryor comment on how a transfer is done and the whole process. If you're a widescreen lover you'll like this, and perhaps you can convert full frame lovers by having them watch this... or not. Finally, rounding the section out is a Glossary that lists common film terms and even gives examples for some. Though some of you probably know most of these, it's a nice set of words for those who may not be familiar with them. The Interactive Slide Show is a nice feature. It's set to the film's score and shows various slides of models, the cast, crew and more. When the Hakatomi symbol appears and you press it, you'll get more information on the slide. Very well done. The entrie Script is readable without DVD-ROM so you can knock yourself out with that (I always like having the script without using DVD-ROM, it's a rare feature on discs though) while the Ad Campaign section has three trailers (all in anamorphic widescreen. The first is 2.35:1 and the other two are 1.85:1), seven TV Spots (ah, nice memories) and a full frame, seven minute and twenty-two second Featurette with clips from the film, behind the scenes footage and on-set interviews with the cast and crew. It's pretty EPK style. Finally, more DVD-ROM features: weblinks and game demos, so enjoy those. Also, the animated menus really fit into the style of the film and are nicely computer animated, so enjoy those. This may be the summer of 2001's best DVD release, if not one of the best of the year for sure. A great presentation, great features and a nice price for a great movie makes "Die Hard" a great two-disc set for everyone's collection.